As Meigas plays traditional tunes and songs from Galicia, which is the northwesternmost province in Spain, located north of Portugal. The music is traditionally played on the gaita – the Galician bagpipe – which is about half as loud as Scottish bagpipes. The gaitas are typically accompanied by a variety of percussion instruments, including the tambourine-like pandeireta, and the bombo (bass drum). Galician culture has its roots in the Celtic cultures of early Europe, mixed with southern Spanish and Portugese influences. The result is a rich musical tradition of lively dance tunes and songs. 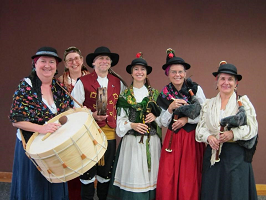 As Meigas is an ensemble based in the Bay Area and dedicated to playing and singing traditional music from Galicia. Pipers are Tesser Call, Donna Denevan, and Cathy Chilcott. Percussionists are Brian Walker, Deirdre McCarthy, and Maureen Brennan.